Joint funeral in Simferopol brings together opposing factions. 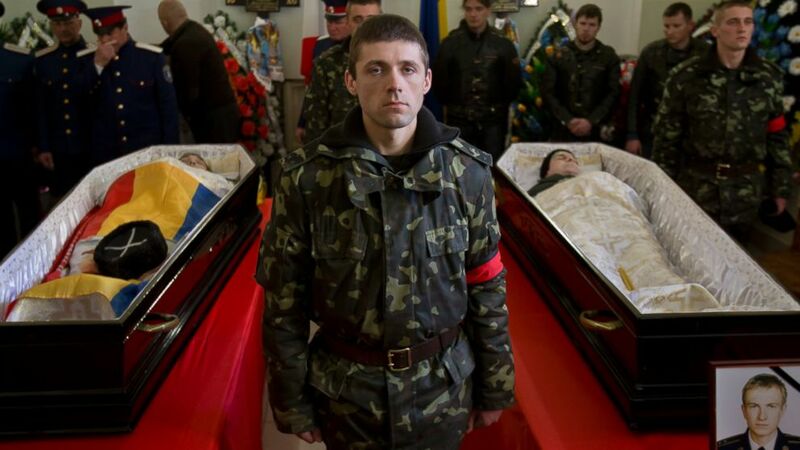 camera (Vadim Ghirda/AP Photo) A Ukrainian soldier looks up standing between the coffins of Ukrainian soldier Sergey Kokurin, 35, right, and Russian Cossack militiaman Ruslan Kazakov, 34, left, during their funeral in Simferopol, Crimea, Saturday, March 22, 2014. Mourners from both sides of the conflict in Crimea put aside their differences this weekend to pay tribute to two fallen soldiers. A Ukrainian soldier and a Russian Cossack militiaman gunned down during a clash at a military facility in Crimea this week were mourned at a joint funeral held Saturday in the capital of Simferopol, the home of Russia's Black Sea Fleet. 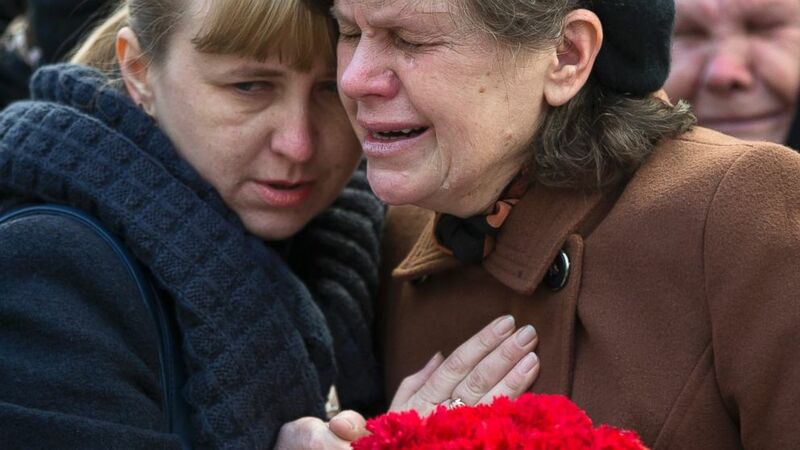 (Vadim Ghirda/AP Photo) Relatives of Ukrainian soldier Sergey Kokurin, 35, during his funeral in Simferopol, Crimea, Saturday, March 22, 2014. Relatives, friends and fellow servicemen from both factions joined together at the Officer's Club to farewell the first two casualties since Crimeans overwhelmingly voted to leave Ukraine and join Russia last weekend. A guard of honor watched over Ukrainian soldier Prapushik Sergei Kokorin, 35, as family members laid red carnations on his coffin and wept, while Russian Cossacks stood over the body of Ruslan Kazakov, 34, in the same room. Local prosecutors on both sides are still investigating exactly how the deaths occurred Tuesday night. 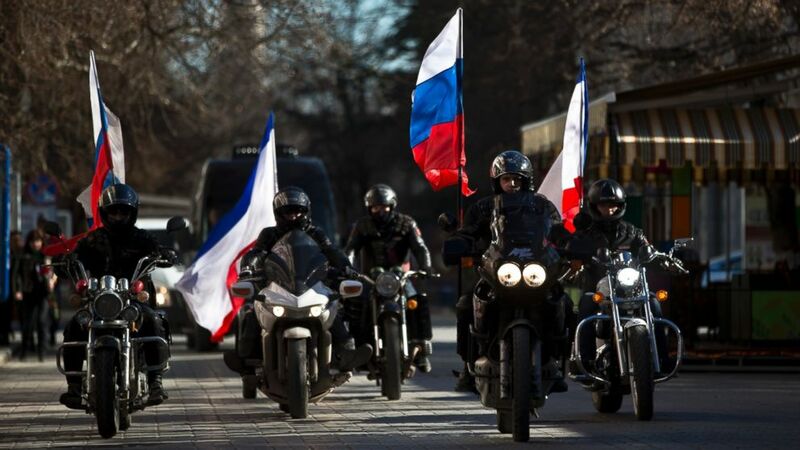 (Vadim Ghirda/AP Photo) People on motorcycles decorated with Russian and Crimean flags drive in front of a van transporting the coffins of Ukrainian soldier Sergey Kokurin, 35, and Russian Cossack militiaman Ruslan Kazakov, 34, during their funeral in Simferopol, Crimea, Saturday, March 22, 2014. The day after the clash, Ukrainian Prime Minister Arseniy Yatsenyuk blamed Russia for storming the military facility, saying the dispute "has gone from the political stage to the military by the fault of the Russians," according to The Associated Press. Pro-Russian Crimean authorities told local media that it was Ukrainian snipers who first shot at pro-Russian self-defense units that arrived amid reports that armed men were in the area. 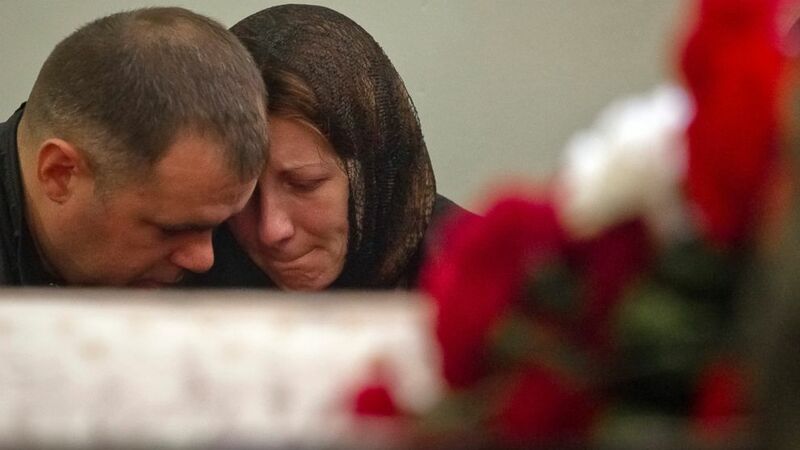 (Vadim Ghirda/AP Photo) Relatives of Ukrainian soldier Sergey Kokurin, 35, mourn next to his coffin during his funeral in Simferopol, Crimea, Saturday, March 22, 2014. The violence highlights ongoing tensions since the Crimean referendum last weekend, which the West deemed "illegitimate," and Russia's subsequent parliamentary vote to annex Crimea. The funeral happened as the Belbek Air Force base near Sevastopol was stormed by pro-Russian forces who are holding the base's commander, Col. Yuliy Mamchur, captive in an unspecified location.